Mission Statement The Sedona Heritage Museum's mission is to research, preserve and teach the history of the Greater Sedona area. Services and Projects Local history related programs: Museum, school Pioneer Days, Living History speakers, oral histories, Collections management, special events, Gift Shop, speakers bureau, many other related programs and services. Want a great way to meet new people, engage with the community and share your knowledge with visitors and residents? Whether you're new to town looking for a way to build a social network or a long-time resident wanting to share your knowledge and love of community, the Sedona Heritage Museum needs volunteers and docents at the historic Jordan homestead in uptown Sedona. Not a historian? No problem! The training is fun and easy. No experience required! If you have a few extra hours this summer and a desire to connect with others while having fun, please contact the Volunteer Coordinator at the museum (928)282-7038 or volunteercoordinator@sedonamuseum.org. Do you like to play with sound equipment, AV or lighting? The venue at the Sedona Heritage Museum hosts about a dozen lectures and special events a year that require amplified sound, set-up of our theater lights and/or playing video or other digital presentations. We need an equipment savvy volunteer to assist with these events, help us make decisions about equipment upgrades and do general maintenance of existing/new equipment. Sound like something you could get into? Call Bill Levengood at 282-7038 if you are interested and want to help bring us these programs to our community. Looking for a way to bring your love of history, Sedona and writing together? The Sedona Heritage Museum currently has need for someone just like you to help gather and compile pioneer stories from the Sedona area that will be assembled into a local book of Sedona pioneer stories. Tasks will include interviewing family members and getting final approvals for the stories that are used, some typing and other miscellaneous tasks to help get the manuscript ready for the printer. This is a great way to explore our local area's historical tales. Please contact Janeen Trevillyan at the museum at (928)282-7038 if you are interested in helping with this project. Want to help preserve some of Sedona's classic stories for the next generation? The Sedona Heritage Museum is seeking 1-2 volunteers to re-type a few short books by Sedona author Kate Ruland-Thorne who has generously transferred the copyrights to some of her out-of-print, Sedona based titles to the museum for republishing. Her titles include "The Legacy of Sedona Schnebly," "Upon This Rock: Marguerite Brunswig Staude and her Sedona Chapel," "Experience Sedona: Legends and Legacies," "The Yavapai People of the Red Rocks: People of the Sun," and "Gold, Greed and Glory: The Territorial History of Prescott and the Verde Valley. If you'd like to help digitize these classic Sedona works, please contact Janeen Trevillyan at (928) 282-7038 for details. Do you love teaching children and seeing their eyes light up with the spark of wonder? Are you an ex-educator and miss those moments when students look at you like you hold the key to a magic kingdom they never new existed? Whatever inspires you to help children learn, the Sedona Heritage Museum has a volunteer opportunity welcoming local school groups that might be a great fit to inspire them with some hometown pride!. The Museum is seeking someone to lead tours with occasional hands-on activities and share local history with local school groups when they visit the Museum. Training will be included. To learn more contact Julie at 282-7038, volunteercoordinator@sedonamuseum.org. Love making videos and looking for a cool place for summer? Come enjoy the A/C in the historic rock house of the Sedona Heritage Museum, make cool new friends and help document the museum's Living History program. This volunteer would be available 6-8 times/year to tape some of the Museum's "Living History" speakers between October and May. Time involved would be set-up, program taping (about 1-hour) and then burning 2 copies to DVD. Are you an amateur videographer who would like to do this? Please contact the volunteer coordinator at the museum at (928)282-7038 or volunteercoordinator@sedonamuseum.org. The Sedona Heritage Museum still needs energetic volunteers to help bring the history of Sedona alive to our visiting guests. 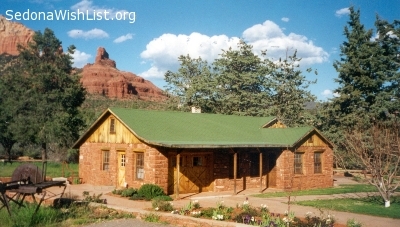 A great opportunity to spend time in the historic, Jordan homestead where the museum is located in uptown Sedona. The museum currently needs docent help. No experience necessary! Fun, easy training! If you have a few extra hours and want to immerse yourself in historic ambience, meet new people and share your love of history and Sedona with visitors, contact the Volunteer Coordinator at the museum (928)282-7038 or volunteercoordinator@sedonamuseum.org. 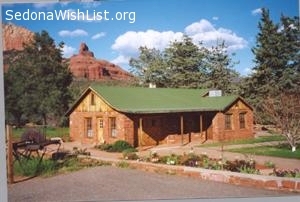 The Sedona Museum is grateful to the Sedona Wishlist for helping to partially fulfill the wish for a volunteer. We could still use a little more help. With fun training immersed in the rich history of Sedona at the museum's location in the historic Jordan home, this is a great opportunity for anyone with a passion for history and a little time on their hands. Won't you come join us in sharing Sedona's past with visitors? Contact us at 928-282-7038 or volunteercoordinator@sedonamuseum.org. The Sedona Heritage Museum is looking for a volunteer who likes to take videos. This volunteer would be available 6-8 times/year to tape some of the Museum's "Living History" speakers between October and May. Time involved would be set-up, program taping (about 1-hour) and then burning 2 copies to DVD. Are you an amateur videographer who would like to do this? Please contact the volunteer coordinator at the museum at (928)282-7038. The Sedona heritage museum has a few items available. For a small donation (around $5 each) we have two 2-drawer file cabinets (one letter size, one legal size) and for FREE, a wooden retail shelf. Items can be picked up during the museum's normal business hours between11-3. If you are interested in any of the items, please the call museum in advance (928-282-7038) before you arrive so onsite docents know to expect you. Calling All Artists!! There's still time to join! Local artists and crafters are invited to sell their hand-made items at the Sedona Heritage Museum's Fall Arts & Craft Fair Sat Oct 21, 9am-3pm. Call 282-7038 or email (Info@sedonamuseum.org) for a registration application. $30 tent spaces still available. Put your unique, locally made wares in front of hundreds of visitors and residents shopping for their own use, collections and holiday gifts. Calling all crafters and cooks! The Sedona Heritage Museum is looking for people to present demos and workshops on old-time crafts for the Monday at the Museum program. If you can do something you'd like to share, please call 928-282-7038. Calling all artists and crafters! Come join our Fall Arts & Crafts show at the Sedona Heritage Museum October 21 from 9am to 3pm! Free admission! Local venue for local artists to show/sell their work. Great exposure to a broader audience as this established event is well attended by locals and visitors. Booth cost is $30-40. Provide your contact information to Nicole at the museum (282-7038) or connect@sedonamuseum.org and a registration form will be sent to you. Help save the history and images from programs and events that no longer exist! The Sedona Heritage Museum needs a volunteer to scan and assign file names to digital files for a large donation of photos from past Main Street Program events. Great opportunity to view images of days gone by. No deadline or schedule. Contact Janeen at the museum (282-7038) or info@sedonamuseum.org for more information. The Sedona Heritage Museum needs energetic volunteers to help bring the history of Sedona alive to our visiting guests. A great opportunity to spend time in the historic, Jordan homestead where the museum is located in uptown Sedona. The museum currently needs docent help, especially Saturdays and Sundays. No experience necessary! Fun, easy training! If you have a few extra hours and want to immerse yourself in historic ambience, meet new people and share your love of history and Sedona with visitors, contact the Volunteer Coordinator at the museum (928)282-7038 or connect@sedonamuseum.org. The Sedona Heritage Museum would like to offer a deep and heartfelt "thank you" to the Sedona Wish List, the Sedona community and our wonderful volunteers for all your support during 2016! We are looking forward to a fantastic 2017!! Thank you so much, Happy New Year!!! The Sedona Heritage Museum needs energetic volunteers to help bring the history of Sedona alive to our visiting guests. A great opportunity to spend time in the historic, Jordan homestead where the museum is located in uptown Sedona. The museum currently needs docent help, especially Saturdays. No experience necessary! We will train you! If you have a few extra hours and want to immerse yourself in historic ambience, meet new people and share your love of history and Sedona with visitors, contact Nicole at the museum (928)282-7038 or connect@sedonamuseum.org. The Sedona Heritage Museum has a Star TSP600 Thermal Receipt Printer available that is no longer used. Works fine, except on Windows 10. Free to a local nonprofit. Please contact Kathie Hamblan at the museum (928-282-7038 or info@sedonamuseum.org) if your organization is interested. The Sedona Heritage Museum wishes to add artwork and artifacts from original members of the Cowboy Artists of America to their permanent collection. As the repository for local history, the Museum would like to celebrate Sedona's art history with future exhibits of work by local artists, especially the founders of the Cowboy Artists of America. No where else in Sedona can members of the public view CAA art in a public institution. Donations may be tax deductible. Contact the Accessions Committee at the Museum @ (928)282-7038 or archives@sedonamuseum.org with any questions or to donate. The Sedona Heritage Museum needs energetic volunteers to help bring the history of Sedona alive to our visiting guests. A great opportunity to spend time in the historic, Jordan homestead where the museum is located in uptown Sedona. The museum currently needs docent and gift shop sales help, especially on Mondays and Saturdays. No experience necessary! We will train you! If you have a few extra hours and want to immerse yourself in historic ambience, meet new people and share your love of history and Sedona with visitors, contact Nicole at the museum (928)282-7038 or connect@sedonamuseum.org. The Sedona Heritage Museum would like to thankTracey Van Dyke for taking wonderful new, updated photos of the museum & grounds for us. These photos will be used in updated PR and Marketing materials, important to the museum. Much appreciated! The Sedona Heritage Museum has recently completed updates to the self-guided tour brochures and needs help translating the current English version into other languages. We are still seeking French speakers to help us translate the brochure into French. Please contact Kathie Hamblen at the Museum (928)282-7038 for more information if you are able to help! The Sedona Heritage Museum has recently completed updates to the self-guided tour brochures and needs help translating the current English version into other languages. We are still seeking Japanese speakers to help us translate the brochure into Japanese. Please contact Kathie Hamblen at the Museum (928)282-7038 for more information if you are able to help! The Sedona Heritage Museum has recently completed updates to the self-guided tour brochures and needs help translating the current English version into other languages. We are still seeking Spanish speakers to help us translate the brochure into Spanish. Please contact Kathie Hamblen at the Museum (928)282-7038 for more information if you are able to help! The Sedona Heritage Museum is still in need of a new office "task" style chair. The chair would be the type with wheels and no arms, adjustable in height. Please call or email Kathie Hamblen at 928-282-7038 (khamshs@yahoo.com) if you can help! The Sedona Heritage Museum is working to catalogue a series of historical information DVDs. The museum needs help reviewing the DVDs and completing a form to capture relevant pieces of information to properly catalogue those items. This is a great opportunity for anyone wanting to learn more about our history and assist the museum in making those important resources available for the future. Watch one, or watch many: Any level of participation is greatly appreciated. To help, please contact Kathie Hamblen at the museum (928)282-7038. The Sedona Museum is looking to plant some Russian Sage along the back of the Cook Cemetery (next to the Elk's Lodge in Sedona) to help cover the view of the fences. If you have an abundance of Russian Sage growing in your yard that would like thinned out, that we could use, please let us know. For additional information and to make arrangements, please contact Lisa Hyatt at the museum (928)282-7038. The Sedona Heritage Museum is need of a Railroad or Industrial Supply calendar, circa 1880-1910, along with any artifacts regarding the glory days of filming in Sedona. These items will be used to help our historical displays help tell the story of Sedona's past. Please contact Ron Maassen at the museum (928)-282-7038 for any additional information needed. Have any old photos from the Sedona West Movie Set? We’d love to have you share them with the Sedona Heritage Museum to help provide our visitors a glimpse into the past. We are particularly interested in any color photos or interior shots of the Telegraph Office. All photographs will be scanned and the originals returned to you. Contact Lisa Hyatt at 928-282-7038 to make arrangements.